This painting relates to the site of Marrapinti, west of the Pollock Hills in Western Australia.In the Dreamtime (Tjukurrpa), a large group of women camped at this rockhole before continuing their travels further east, passing through Wala Wala, Kiwirrkura and Ngaminya.While at Marrapinti, the women made the nose bones also known as Marrapinti, which are worn through a hole made in the nose web. These nose bones were originally used by both men and women but are now only inserted by the older generation on ceremonial occasions. As the women continued their travels towards the east they gathered the edible berries known as Kumparapara or desert raisin from the small shrub Solanum Centrale. These edible berries can be eaten directly from the plant but are sometimes ground into a paste and coked on charcoal as a type of damper. Nyanyuma Napangati was born around 1944 in Kiwirkurra, Western Australia. She is the sister of painter Charlie Tjapangati. 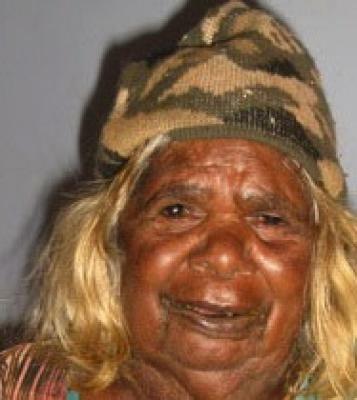 Their father had three wives and was the older brother of well known Papunya Tula Artist Pinta Pinta Tjapanangka. She is also closely related to the late Kanya Tjapangati, who passed away in 2006, through the same father but a different mother. Nanyuma Napangati beg . . .